Amid dwindling spectator count and mounting administrative hassles, the Formula One carnival is all set to hit the national capital this Sunday with the third Indian Grand Prix, which faces an uncertain future after being pulled off next year's motorsport calendar. As if the wrangling over taxes and clearances was not enough, the event is now facing a Public Interest Litigation in the Supreme Court, seeking a stay on the conduct of the race. The apex court will give it a hearing on Friday when the drivers warm up in the practice session. Amid the off-track drama, greatness will be witnessed on it when a dominating Sebastian Vettel is crowned the youngest quadruple world champion this weekend. With five comfortable wins in a row, the Red Bull driver has opened up a huge 90 points lead over nearest rival Fernando Alonso (207) of Ferrari and needs just a fifth-place finish to clinch his fourth straight world title. Only two drivers before Vettel have won four straight titles -- Juan Manuel Fangio from Argentina and German great Michael Schumacher. The 26-year-old German is the only driver to win the Indian Grand Prix so far and the way he has dominated the second half of the calender, it looks unlikely that he would be challenged too much in his bid to score a hat-trick of wins at the Buddh International Circuit. However, the legend-in-making is not ready to take his foot off the pedal yet. "It is not an easy track, because of a few complicated rhythm-breakers that are in there. The most difficult part is the uphill entry to Turn 3, because seeing the apex is practically impossible. 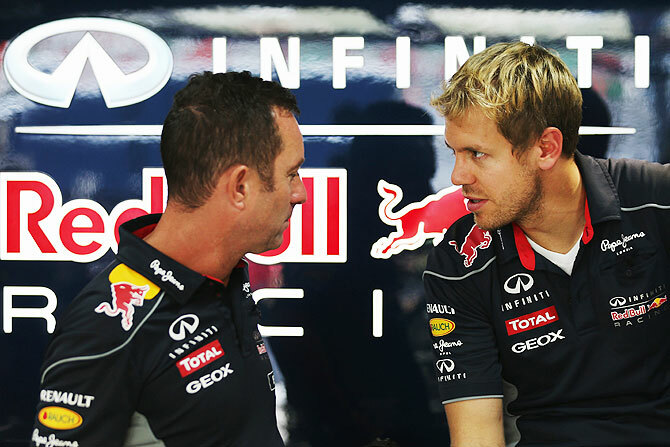 So to drive a perfect lap around the Buddh circuit, you need good driving instincts," he said. "So far everything has always gone perfectly for us in India. There is also a very nice trophy at the end of the race, so it would be great to hold one again this year. 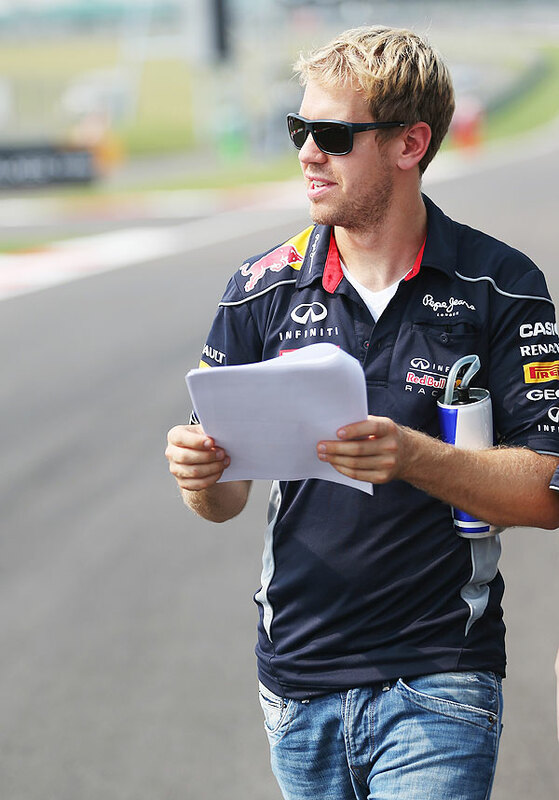 It's a circuit that I like, in a country that is very, very impressive every time we go there," Vettel added. Alonso has already conceded that the title race is over even though there are mathematical chances of him taking over Vettel but in that case the Spaniard has to win at least three of the four remaining races and the Red Bull driver must not score a single point. The drivers championship and constructors' title is almost in Red Bull's pocket but a fierce fight in teams' championship is on as Ferrari (297) leads Mercedes (287) by just 10 points. Lotus are fourth with 264 points. So, the drivers to watch out for apart from the Red Bulls' are two-time champion Alonso, the young Nico Rosberg in his Mercedes, 'iceman' Kimi Raikkonen and his Lotus teammate Romain Grosjean. Rosberg has two wins this season while Grosjean's form of late has been superb with two consecutive podiums in Korea and Japan. 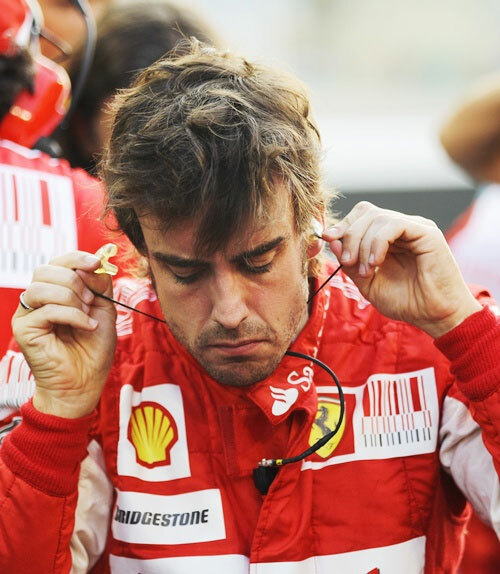 Raikkonen has been struggling with pace and so is Alonso. However, both of them have negated their poor qualifying with outstanding driving skills on Sundays and Alonso has a good record at BIC as he finished on the podium in previous two editions. The mid-season tyre change has hit Ferrari badly as they have been struggling in qualifying. It is a 'home' race for Sahara Force India, which now has a fight at hand to save the sixth place in the constructors championship. They have 62 points and at one time they were challenging McLaren for the fifth place but the tyre change post the Silverstone blowouts hit the Indian outfit the most. After that they have managed to score just three points in seven races. Now they have only a 17-point lead over Sauber, which has scored 38 of their 45 points in the last four races. Force India drivers have already said that going by the circumstances, scoring a point in the home race would be tough and that the big teams must stop making mistakes since they were gifting free points to Sauber. And it will be the first race where there will be no Indian driver on the grid. Narain Karthikeyan had driven for Hispania in 2011 and 2012 but his team pulled out of the 2013 season, leaving him plying his trade in AutoGP series. Meanwhile, the general mood in the motor-sport fraternity in the country is that the race would not return in 2015 as has been planned by the promoters. And, if scrapping of the 2014 edition was not enough, a lukewarm response to the ticket sales has just added to the gloom year with only 40,000 tickets reportedly sold so far. The first year had seen a packed house as close to 90,000people thronged the BIC to watch the inaugural race. Last year 65,000 fans turned up but getting close to that looks tough for the promoters.